Summer time means salad season. Fresh veggies, delicious fruits and warm nights, spent enjoying outdoor meals with family and friends. To make your fresh meal burst with flavor, make something real, with something real: Litehouse dressings. In the refrigerated produce section, where real dressing should be. I love May—it means spring giving way to early summer—warm, sunny, humidity-free days and farmer's markets offering fresh produce—perfect for my renewed health/weight goals. Except this year, May didn't look that way, at least not in Baltimore. We had three weeks of straight rain and chilly temps. While I refused to bring my boots back out, I was wearing tights with my dresses which I equally detested. It also meant no farmer's market trips or extra long walks with Anise. Yes, I said it. No, I'm not mistaken. Litehouse dressing is as fresh as the produce and thus I get it from the produce aisle. It's refrigerated since it lacks the excessive preservatives that allow other dressings to hang out on grocery store shelves for indefinite amounts of time. When you shop for produce, you don’t shop in the condiment or baking aisle. You head to the refrigerated section where mouth-watering fresh veggies are brimming with color and flavor. That is where you will find Litehouse: fresh tasting, refrigerated and delicious dressings. I'm eating a lot more salad these days with my personal goals in mind and I prefer my dressing homemade for the very reasons I just mentioned. I often whip up a quick vinegarette at home, but when you're eating salad daily, it's great to have variety and indulge in a creamy bleu cheese (or ranch, we have that, too!) that I know is as good as homemade since it lacks the icky stuff! This week, spring finally came. 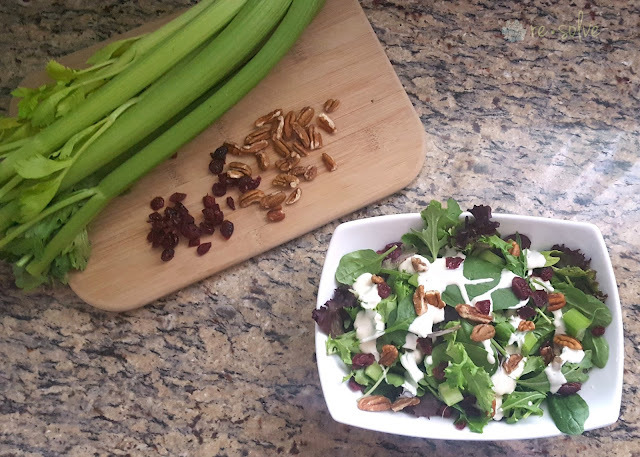 I took Anise out for a long walk before rushing to the fridge to put together this yummy salad in celebration: my go to spinach/spring greens mix topped with celery, apple, pecans, and dried cranberries, all tossed in the perfect complement: Litehouse's chunky bleu cheese dressing. 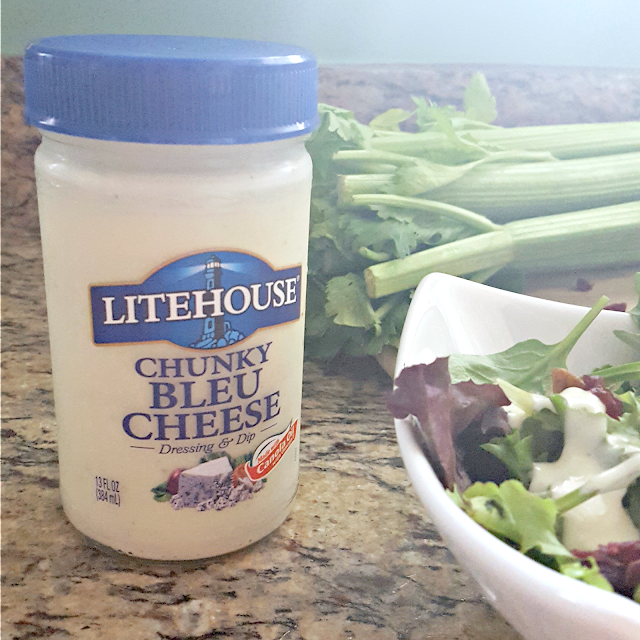 .Litehouse Inc. is a leader in refrigerated salad dressings, veggie dips, sauces and Instantly Fresh™ Herbs. I'll be making this one a lot more often: bleu cheese pairs perfectly with the toppings I chose...it also pairs perfectly with a glass of bubbly, making my summer dinner delicious and complete! This salad looks great! I love serving salads in the summer. That salad looks delicious! We've been eating a lot more salad in our house, too. I'll have to look for this dressing the next time I go shopping! I love their salad dressings. They are delicious! This looks like the perfect Summer salad! I'll have to make these with the food on Father's Day, my dad is a major fan of bleu cheese! I would make a spinach, pineapple and strawberry salad with the ORGANIC RASPBERRY LIME VINAIGRETTE. I love adding whatever kind of fresh veggies I have in the house plus cheese or bacon, the possibilities are endless. I'd make lettuce, tomato and onion salad. I would make a great steak salad. In the summertime I like to add blueberries and strawberries to salads. My husband and I like to eat more salad during the summer. I love blue cheese dressing. I love salads especially when the weather starts to get warmer as I like to eat lighter. My family loves a nice summer salad. We love salads. We eat them a lot. We like to add bacon but with ranch. Salads are so refreshing. I love blue cheese dressing. I love making pasta salad, perfect for summertime! I am a long time lover of Lighthouse dressings, I love that it's refrigerated and fresh tasting not with a bunch of preservatives sitting on the shelf more like homemade. I love salad in the summer and I would either make a pasta salad or tomato mozzarella salad. I would love a salad with romaine, feta cheese, strawberries and walnuts please. kristiedonelson(at)gmail(dot)com Thank you. I would make a spinach, tomato basil with the dressing on it with some cheese mixed in and artichokes too. I'd make a salad with lettuce, tomatoes and chicken topped with ranch dressing. I want to make a salad with Romaine lettuce, shredded carrots, grilled chicken, bacon, eggs, tomatoes & ranch dressing! I'd make our usual salad with romaine, english cuke, croutons, parm, & caesar dressing. I'd make a spinach salad with a boiled egg, black olives, and smoked salmon. I'll make a summer salad with what I find at the farmer's market and some yummy Litehouse dressing. I'd make a spinach salad with berries & nuts. These look yummy. would love to win!